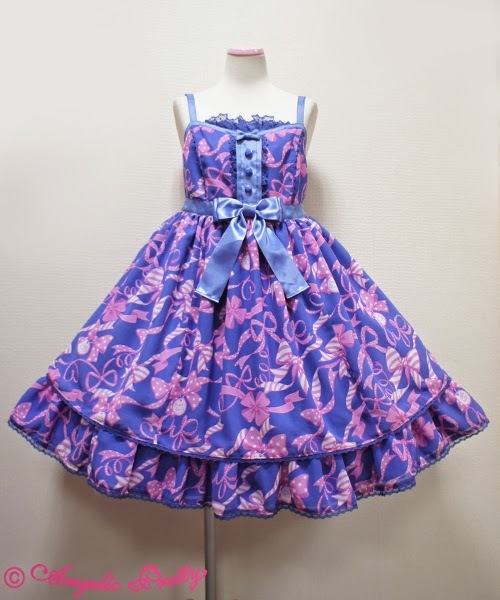 Angelic Pretty's 2014 release of "Wrapping Ribbon" brought new styles and colors. Of those my favorite has been the new JSK which features removable lace at the bust, high quality satin bow details and delicate lace detailing along the princess seams. Bust details along with the removable lace at the top. Inside of bodice showing the removable panel. Soft satin double bow at the waist. Princess seam lace detailing on bodice. Lace along the dress's hem. Bow details adorn the ends of the waist ties.